GOOD MORNING! 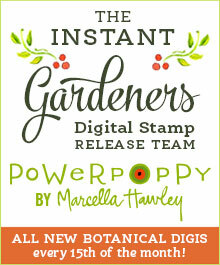 I back today with another card featuring one of the new digital images from Power Poppy. This time I used the Country Home Christmas digital stamp, previously released in clear format as Simple Joys. I love the simplicity of this image so I kept the card design simple as well and opted for vintage tones of mauve, teal and silver. I added clear Wink of Stella to the ornaments to add a little sparkle. I added the sentiment from the new Filigree Tree digital stamp to complete the design. That’s all for now! Hope you find time for some crafty inspiration today! Great job Nancy, like the soft colors and simplicity in your card.